"Everything in the unconscious seeks outward manifestation, and the personality too desires to evolve out of its unconscious conditions and to experience itself as a whole." Black Replica is a collaborative project between Heinrich Mueller and a female identified only as Black Replica which officially began their MySpace account on 16th October 2006. However, thanks to the sole interview Black Replica herself gave to Pawel Gzyl for the Polish webmag Gaz-Eta we know that they were calling themselves Black Amnesia during their embryonic stage. This project marked Mueller's first move towards what might be deemed a totally virtual group, the live appearances outstanding, he has to date become involved with three in total. Certainly it could be said that in this mode they exist more solidly in our imagination than on our record player. Perhaps it is just this private replica version of the group in our imagination which is being hinted at in their choice of name? There is also something about the whole process of no commerce taking place or format passing between us and the experience which gives it all a different energy. We go to them and not the other way round, getting to know their music and becoming a fan is purely an act of discovery on our part. It is hard to criticise such a generous offer as this and I am grateful for it. Nevertheless I’ll go as deep as I can with it in this piece and hope to bring to your attention some elements you may have missed and tease out how I believe their concept continues on from previous Mueller projects. So what substance have we got after almost two years? We have simply four tracks, two of which have video's, a few images and five live performances. Furthermore there have been no extra tracks or video's added since about the first month of their inception which sadly makes it look more and more like it is a one off. Although I wouldn't be surprised if there was suddenly more from them at some point in the future. These bare components have produced their own statistics which impressively belie their origin with almost 70000 profile views but more importantly well over 30000 combined plays to date. The viewing figures for the two video's combined currently reach almost half that figure on YouTube, not bad. If these four tracks had simply appeared on a 12”, as they would in the past, they would have reached a far smaller and concentrated audience. Released in this way they can and do reach so many more and in so many destinations and will continue to do so for a very long time. It's a shame these cold figures cannot tell you what is happening in the imaginations of the people they correspond to, something thankfully beyond the comprehension of mere computers and the internet. It is just this imaginary aspect that Mueller himself must have experienced when first listening to the likes of Kraftwerk and what to him were other mysterious and exotic sounding electronic artists of the time. If it was not for this experience he might never have started making music himself and it is not every listener that can suspend belief while staring at those record covers, titles, type faces and everything else extraneous to the music, while being transported to other places and dimensions by it. These type of people gain a dose of some intangible thing which can last and a lifetime and inspire their own creativity for just as long. I believe he has certainly not forgotten this feeling and knowing the potential of the growing power of the Internet he has the opportunity to provide just such an experience, en-masse, for others. He and Black Replica are also no doubt getting a different kind of kick out of it themselves, the chance to be Oz behind the curtain perhaps. Not that he and James Stinson weren’t already Oz figures to some degree before but he continues to be. Before I tackle the music I need to explain who does what. In the interview it is not surprisingly stated by Black Replica herself that her duties are, “Singing, lyrics and visual aspect.” Which leaves it safe to assume that Mueller does all the music and that everything else, including the videos, comes from her. She says, “It came natural to cooperate. We both like each others theories.” implying that they share or at least appreciate the differences in each others ways of working. So we can assume that Mueller approves of her visual presentation. Officially on MySpace they describe their music as Other/Experimental/IDM. Well it is certainly other and experimental and probably could be argued as intelligent dance music. This is just one of those things you must fill out on the template and the options are always limited anyway and it was probably the closest to what they felt comfortable with. In the interview Black Replica described how they sounded as, “Dark, cinematic electronic,” and how it looked as, “Classical futurism; dark with glimmers of light; emotional." When considering what the music is like, keep in mind that all of the tracks are led by female vocals which is a total departure for Mueller's production. ‘Mathematical Eyes’ is certainly unlike anything produced by Mueller before. The tempo is very slow with an almost nursery rhyme sounding lyric, but confusingly sung in German. I was sent the German words and English translations which are as follows. "Der höhepunkt ist erreicht worden. Mathematische augen - suchen um sich - sehen - muss das zusammensetzen...innerhalb ihrer vorstellungen....es kommt alles zusammen. "The climax has been reached , the climax has been reached, ..., mathematical eyes are searching - looking - I have to unfragment all - in my imagination - it all comes to a point." The reader who did this for me also confirmed it is sung in German without an accent. They went on to point out that there is a small double-meaning in the last sentence, "it all comes together", which can either mean reunion or it comes to a certain point of climax. The track is very sparse in the music department, a number of times the music drops out altogether and just her haunting voice is left. This is very eerie stuff, very much something which conjures dark images in your imagination. Speaking of images there is a video to go with this. In it Black Replica is wearing a black hood and cape and is seen walking along a path in a forested area. Then we see her at a lakeside with a circular hand held shield like object with the Ψ symbol on it. At this point in the track the music very much suits what is happening in the video, even with backward sounding stuff. So much so you wonder what came first. She kind of seems to run away but then returns with a black shield in her hand which she exchanges for a shield with the symbol which a little boy gives her. The scene just before this with the backwards sounds kind of gives you the impression she pulled the child out of the water. The image throughout the video is black and white and very grainy/low resolution so it’s hard to make this figure out. The child appears to be wearing a full head to toe black body suit. Then the child bows and points into the lake and speaks with the girl. We return to images of Black Replica walking round with her new symbol emblazoned shield. We see her with the child following walking up a hill. You can see in this shot she is wearing very high heels and has lost the cape revealing a similar black body suit to the child who now seems in this light to have been wearing a balaclava with eye holes as well. The child looks very alien to me. Then she’s back at the lake for a second then we see the opening forest walk scene again but backwards. Next we see her crouching down in the forest with her shield before the final shot of her on rocks back at an expanse of water, probably the lake, holding a staff and splashing water with her hand on the surface. The video goes colour for these final scenes. The next video doesn’t really follow on the ‘story’ but is in keeping with the style. ‘Spider Theory’ by contrast is interior. It’s a very different video with close up shots of her face, her hand holding a small shiny circular object, maybe a hand piercing and a close up of a spider. Interestingly it is hanging from its spindle from her fingers, it even crawls along her hand for a while and it’s a big one! Perhaps the title came from the video? It ends with her staring out the camera with a little red flash right on the final frame. The video is in the same very grainy black and white as before. I must say, even though this is as totally subjective as my opinion of the music, she is a strikingly beautiful woman. Her short blond bowl cut and tight body suit complete a very strong look. I would guess she is German but that is speculation, she somehow looks German to me and she seems to sing it fluently but hard to tell. It is a short enough track also, the music for it is similarly sparse and is mostly made up of her vocal samples with some rhythmic electronics running throughout. The lyric this time are in English and go, “That was all she saw/said?” Incidentally if you play it backwards, yeah I am nuts, it sounds very much like, “She shouldn’t have”. This track is even more eerie and disturbing than the former, especially when heard backwards! 'Twilight Pupil' again returns to a vocal led template with reverb laden electronic touches throughout. The lyrics prove again to be the hook, “Why, love, you, can you come in? Have I sinned?” This, in a very halting delivery, is what it sounds like to me anyway. This track puts me in mind of 'Spider Theory' in that it is a short enough relatively abstract track also. The final one, ‘Black Feathers’, is incredible, for me the absolute pick of the bunch. Again the lyric is in English, “Yesterday I woke up and found black feathers in my shoes” I think it was this one which made me investigate how the others sounded backwards because this one definitely uses that effect in places. Although in this case it turned out to be just another nonsense collection of sounds backwards. The music is as good as anything Mueller has done to date, having a great bass line, drum pattern and synth. Going by her quote, “Memories and history also play an important part...” this lyric has to be a personal memory at least. Maybe on only ‘Black Feathers’ could there be argued that a few of his production signatures can be found but in the main the four tracks offer a very fresh and original sound template for Mueller. They definitely sound like they were done specifically for this project and certainly don’t come across as simply outtakes or stuff that didn't make the grade for other projects. Although I would have to state that one or two sounds might remind you of something from the next album to this by Dopplereffekt, Calabi Yau Spaces, but this is more than excusable as it probably came from the same machines, studio and person. Some additional basics are revealed in the interview I mentioned earlier. How they met for example, "We met through his colleague, To Nhan Le Thi, who has been the closest friend to my soul for many years." We publicly learned in the 2006 French magazine interview in Chronic'Art that To Nhan Le Thi is Mueller's wife so we are simply dealing with a collaboration with one of his close acquaintances or friends. What is her opinion of him, “He is very intellectual, creative and likes the challenges these bring. He is also very forward thinking and I love his style of sounds. It came natural to cooperate. We both like each others theories. I very much respect his musical compositions and theories - he truly expresses the notion of science through the music. He is well organized and conceptually sound.” Her previous musical experience is revealed as, “Singing and playing the drums.” In addition to setting up their MySpace account they were savvy enough to realise that few people would see their video's if left solely on MySpace so they created a separate account with YouTube under the user name Paradox Twin. This would I presume be a variation on the title ‘Twin Paradox’ from the new at the time Arpanet album, Inertial Frame. There’s not much more to learn from this account save the additional text ‘Electronic music’ and ‘Technical development’. Personally I don’t think this is a very important question but I know it is one which people will expect me to tackle. It is the why question. Why not I would say, the most obvious thing is that there’s just no money in it but that is not important to these artists, for this project at any rate. Once that ceases to be a concern then there are no limits. Quite an irony, there’s no guarantees either but you take a chance and put something out in the world without restrictions and it will eventually go as far as it deserves. It has been created and now exists in the universe for all time. Whatever happens for it will happen. They are probably just acting on their instincts as artists. Which reminds me of something the graphic novelist and magician Alan Moore said, "When we are doing the will of our true self we are inevitably doing the will of the universe. In magic these are seen as indistinguishable, that every human soul is in fact one human soul. It is the soul of the universe itself and as long as you are doing the will of the universe then it is impossible to do anything wrong.” You should also keep this in mind when I discuss the meaning of the soul for Black Replica later. Of course it could also represent things of a more pragmatic nature to the artists involved. From Mueller’s perspective it could be seen as an experiment with new technologies and digital distribution. A way to discover the pros and cons of this approach, what does and doesn't work. Or if you want to view it from a more cynical marketing perspective you could see it as a profile raiser, a way for him to reach new worldwide markets, a way to intrigue a few more people towards your other projects as well. It could also simply be a way to do all of the above while also getting to do something separate from his normally expected output by collaborating with someone else to re-energise his approach to making music. I think it’s always useful to use the science analogy when asking yourself why kind of questions with Mueller and co because everything they do may simply be viewed by them as an experiment. I have a feeling that in spite of the dark and foreboding image and pose struck by Black Replica that the project has probably by now become something of a gentle amusement to its creators. I might be wrong but if I was them I would be more amused than anything else if after all this time that people were still listening, discovering and trying to figure it out. There can be no answers with something of this nature as it stands now, there can only ever be speculation. The only question I personally have regarding them is will there be more? The interview which Black Replica gave was done by email so she would have had ample time to word exactly what her responses were. Therefore I feel confident to place the bulk of my interpretation of the concept of all this on exactly what she said on it. She said, “The subject or concept of Black Amnesia is about the future of the human emotional state, the science and theory of it, dreams versus reality, the impending darkness of the future of the mind, and how we have to face this. Memories and history also play an important part, may we learn from them. Psychological.” It is actually very hard to find much to back this statement up beyond a very surface meaning in the work itself. As I stated earlier we have very little to go on, a symbol, a few lyrics, four titles and the contents of two video's. In fact without this interview I fear we would be almost completely at sea with what it all means. Although everything we need to know could be contained in the 'Mathematical Eyes' video but they don't make it easy. But going back to what she says, “The future of the human emotional state, the science and theory of it.”, my interpretation of this part is that they are simply interested in where the collective human soul is heading, psychologically speaking. Psychology is the scientific study of mental processes and behaviour. Then she casually mentions, “Dreams versus reality.” This phrase alone would keep you busy for ever trying to figure it out. I would personally pick reality every time but it is not as simple as that. Who’s reality is it, mine, then what about the wider reality of everyone else I meet? It is great that they are getting us to ask these questions though, she might be saying we must make a choice between dreams and reality. Maybe they mean that what we think is reality, the dream of reality, is what is stopping us from attaining the true reality or conversely they may see conquering reality with a dream of a new reality as the right course. Whichever way it is, we need to awaken from either the false reality we find ourselves in or our dream of what reality is I think. This line of thought is dependent on me using the logic that we create our own realities. It strikes me that we are of course always on the cusp of change, be it personal evolution (where it always has to start) which ultimately then begins to encompass potential change for all. The choice is always there for us to take, but only once we overcome ignorance and know that choice exists. Using this information you could read their original name, Black Amnesia, as to be a reference to just this forgetfulness. Although what the black part means, in both versions, I still don’t know. She next adds a warning about this overcoming, telling us it won’t be painless but it has to be done, “the impending darkness of the future of the mind and how we have to face this.” Part of the solution to this difficulty will be to use lessons from our past, “Memories and history. May we learn from them.” The final word I think explains the nature of this problem, psychological, of the mind. I’ll start a new paragraph from this part on as this gets complicated. My interpretation of the title ‘Mathematical Eyes’ in this context makes me think of someone who can’t see the world on an emotional level, creating a reality for themselves which misses out a whole other sphere of human interaction/reality. 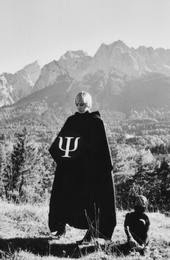 As I have discussed previously, the solo projects of Mueller in the past have been on the surface of this nature, imbalanced towards science, but on closer inspection do appear balanced to show concern for the consequences of scientific breakthroughs for human beings, especially to my mind on the Biometry album by Der Zyklus. Maybe with this project he is choosing to deal with this subject more fully. Bringing the fact of the “...future of the human emotional state” and the “...impending darkness of the future of the mind,” to our attention and also offering solutions which appear to involve “Memories and history...may we learn from them.” But in saying all this the lyrics of for example ’Twilight Pupil’ could mean anything, but the title itself has the ring of ancient and forgotten knowledge about it. To become a pupil of the moon or the night would be something from our past, so we have to remember some ancient knowledge. ‘Spider Theory’ as a title could mean anything as well, which is the genius of it, although spiders would feature in a future Zwischenwelt lyric but I wonder how joined up the thinking is between both of these projects is, it could just be a coincidence. I feel those two MySpace projects probably do connect in a broad sense but I would be surprised if the artists involved were limit themselves creatively by being compelled to make references to each other. 'Black Feathers' as I stated probably refers to a personal memory but it's a fairly abstract one and again I can't see how it fits or any of its lyrics fit to what I have been considering here. They seem to be actively making it difficult to figure out or perhaps feel they have achieved a balance between giving us just enough material to back up what they said about it being about "The future of the human emotional state" and then just drop all this other stuff which may or may not have anything to do with it. One of these things which does tie in with what their stated intentions is the symbol which I will spend sometime going into now. The meaning of the Ψ symbol is very open to interpretation. I have found four possibilities myself but that goes to show what a great symbol in this context it is. Not all of my interpretations could be correct but I have picked the ones that make the most sense in this context. Respecting that Black Replica herself looks after the visual side of the band I would have to say that the first and most obvious meaning would be that it simply represents psychic/soul. Ψ = PSI which starts all the Greek words that describe soul and psychological situations (psihi ΨΥΧΗ = soul). The next meaning is also closely related to Black Replica herself and may be how she most identifies with it. In the video’s and pictures she has a Hindu dot, known as a tilaka or tilak, on her forehead. 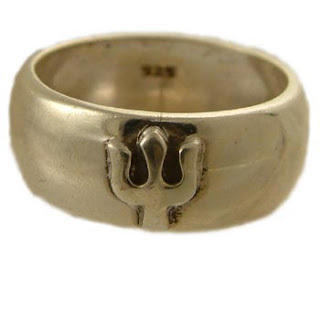 This led one of my readers to research if the symbol has a Hindu meaning and yes it does bear a striking resemblance to what is known as the Trident which is associated with the Hindu God Shiva. I have reproduced some images of it here. The symbol represents the three functions of this God, that of creator, preserver and destroyer. Shiva is the supreme God in the Shaiva tradition of Hinduism. Followers of Hinduism who focus their worship upon Shiva are called Shaivites or Shaivas. In images, he is generally represented as immersed in deep meditation or dancing upon the demon of ignorance in his manifestation as Nataraja, the lord of the dance. In some other Hindu denominations, Brahma, Vishnu, and Shiva represent the three primary aspects of the divine in Hinduism and are collectively known as the Trimurti. In this school of religious thought, Brahma is the creator, Vishnu is the maintainer or preserver, and Shiva is the destroyer or transformer. The third meaning, or two related variations of it, is how Mueller might prefer to see it. Printed only on the CD itself of the Arpanet ‘Quantum Transposition’ album of 2005 there is the following wave equation. The same Ψ symbol used by Black Replica is unmistakable. This might show us that up to a year before he knew he would soon be using this symbol for Black Replica. Interestingly in particle physics the same symbol also represents the Ψ particle. This particle was discovered in 1974 by a group led by Burton Richter at the Stanford Linear Accelerator Centre, who named it as the Ψ particle. Unbeknownst to then, at about the same time in November 1974, the team of Samuel Ting at the Brookhaven National Laboratory found the same signal. They had dubbed their particle, J. It is now commonly known as J/Ψ and has remained a particle which has been studied intensively ever since. So important was this discovery that they jointly received the 1976 Nobel Prize. Why did the first group call it after a Greek letter you might ask? The odd coincidence was that a computer reconstruction of the decay of a J/Ψ particle looks just like the Greek letter Ψ. I’ve reproduced a picture of it for you above. With hindsight, the up to five Black Replica shows announced for Europe were a kind of postscript and counter-balance to their on-line existence. For the record they were as follows Madrid, Spain on 7th April, Gent, Belgium on 28th April, Dordrecht, Holland on 26th May, Leipzig, Germany on 27th May and finally at the Kontra-Musik Festival in Malmo, Sweden on 9th June. With a little effort on your part there are a number of new tracks for you to find amongst the many video's of these shows posted on YouTube and elsewhere. I've noticed with these live video’s of Black Replica, Dopplereffekt etc that the people making and posting them are unwittingly contributing to an extremely valuable archive and store of information for fans, particularly when a new track gets unveiled, perhaps securing the only public record of it. The performances themselves were pure theatre and the perfect colourful and life-affirming balance to their more austere virtual image. Dream and reality if you will. I would guess she also either made or at least styled the costumes herself, of which one had a flashing neon Ψ symbol headpiece. There were also additional video's being projected behind her that were certainly not of a throwaway nature which I presume she also had a hand in. The one of her rolling along in a box looked brilliant. This all would lead me to believe that Black Replica herself is a performance artist in 'real' life. It looked like something she had done before to some degree, she wasn't shy anyway. She did confirm that she had sung and played the drums so perhaps she has also been in a band that has played live? I could write a lot more about just the performances and how they were totally unexpected to be of that nature and the fact that she was alone and without Mueller and essentially doing a PA, but the evidence exists to view for yourselves which although no substitute for being there in person, they gives us an idea of what it was like. I will say that at the time it was the ultimate case of not what was expected when the shows were first announced. I know someone who tried to book them around this time and there was a stipulation in the contract that in advertising the show no mention of Heinrich Mueller or any of his projects could be made or it would not go ahead. The show had to stand on its own. 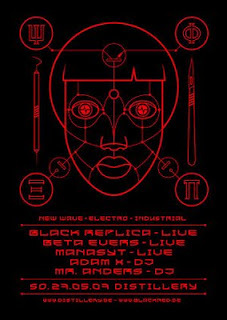 There does appear to be an audience for this kind of electro gothic music and presentation, you only have to look at the other acts on the bill to see it is a movement of sorts, people like Beta Evers for example were becoming popular in the underground. 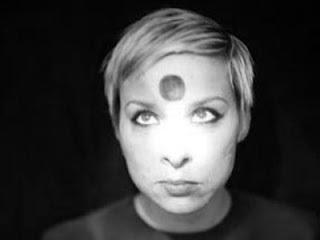 Weird and theatrical female fronted electronic music is still fairly hip. I would like to step off a little deeper in my speculations than normal for a moment, it's only ever the seriously keen and open-minded people who ever read this far anyway! While I can't really produce any concrete proof of such a thing in the material, I think it is worth fleshing out a certain scenario. I think there is a possibility, maybe just on a subconscious level which he himself perhaps doesn't even realise, that there is a link with this whole soul business and James Stinson. I think Mueller on some level may be showing interest in the afterlife of his old Drexciyan partner. Somehow replicating a shadow of how they used to collaborate together? Water in the 'Mathematical Eyes' video is a central image. There too the child passes on the symbol of soul, Stinson’s?, and shows the way, which implies the child obviously has wisdom beyond his years. The child could represent a lot of things but also a sort of rebirth of Stinson existing somewhere in the universe. As stated earlier, the Ψ symbol can also represent water potential. There is more I could say but I think it's a beautiful thought anyway and nothing would surprise me. Great art can be measured by its depth and whether anyone can find their own subjective meaning in it. As I hope I showed when explaining all the possible meanings of the symbol, we are dealing with so many levels simultaneously with many of Mueller's projects, as we also do with Drexciya, that this would be a characteristic you would expect to find in his MySpace projects as well. I believe his next step of the in-between world of Zwischenwelt connects nicely to this concept but again it is not only about this. Only two posed photographs exist. One was provided to illustrate the interview the other is of Black Replica and the child from the video. Also on the visual side, a flyer for the Leipzig show was produced which obviously met with their approval as it can still be seen on their MySpace. Does it add anything to the mystery, probably not if it was simply made by a graphic designer outside of the group. It is a great design though and does include new symbols and images not associated with them up to this point. Make up your own minds. The key thing to remember from all this about the meaning of Black Replica is that they are promoting the idea of using ancient knowledge to inform us how to make the correct choice between dream and reality. Which would help us overcome the impending darkness of the mind they envisage due to increased use of technology. This would be a hugely beneficial evolutionary step to take if we could do this. How exactly this is supposed to happen and what ancient knowledge we should be using is not exactly explained, it may be different for all of us, but it is something from our past. They believe our minds need this before it can be in harmony with the modern physical world. As I mentioned, there are unreleased Black Replica tracks in existence. The live ones which now litter YouTube are the source. You can fit up to six tracks on the MySpace player but to date they continue to only have the same four since that first month. Hard to know why the rest didn't surface officially or if they ever will, time will tell. Maybe the vocals were never completed on the studio versions. The best unreleased one in my opinion is from Madrid, link below. This yet to be realised moment of promise is where I have to leave my information and speculations on Black Replica. I hope, like all the articles in DRL, to have at the very least provided the ground work for the further investigations of others. I don't have all the answers, don't really want them either but what I know only makes me ask more, just the way it should be. The next article I will be coming to is Mueller's next collaborative MySpace based project, Zwischenwelt. Alan Moore documentary, skip the first half hour biog stuff if you want and go straight to the heavy philosophy and magic stuff. You might think it ties in with Black Replica or might not. der höhepunkt ist erreicht worden. mathematische augen - suchen um sich - sehen - muss das zusammensetzen...innerhalb ihrer vorstellungen....es kommt alles zusammen. the lyrics are fragments of german - it is german without any foreign accent - mothertongue german, I think! the climax has been reached , the climax has been reached, ..., mathematical eyes are searching - looking - I have to unfragment all - in my imagination - it all comes to a point. there is a small "double"-meaning in the last sentence. "it all comes together" can mean reunion or it comes to a certain point of climax. the whole text is very ambiguously chain - you don't know, which wordgroups belong together. If this and other projects were for gentle amusement, it would eventualy wear off in time. Time has the effect which cannot be seen at its present, just like it cannot in the past, its pre-exsistence. As you wait your life time will take effect on your central nervous system, sole, for that organ is. No shows have been announced for jan 2009 to my knowledge, but if I hear of some I will post it here. As a native german speaker I would argue that the lyrics to "Mathematical Eyes" are actually sung with quite a notable accent. I'd say it is a French accent. Also, the intonation and grammar are a bit unusual. To me it seems as if an English text has been translated into German using Babelfish. And it's actually "Muster zusammensetzen" and not "muss das zusammensetzen", which means "aggregating patterns". Makes much more sense to me.